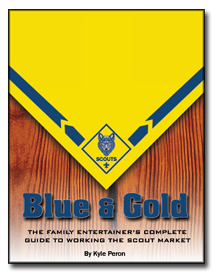 The entertainers complete guide to working the scout market. ever ask for in regards to working not only Cub Scout Blue and Gold Dinners, but also how to work any scouting program and event. This is one of the ONLY books that is devoted solely to giving YOU the information you need to work a market that can generate income for you in the slow times of the year and year round. even a strolling magician, then Blue and Gold Banquets are a perfect extension of what you are already doing. You can learn to work them well with simply modifying your current show and having an understanding of how to market effectively to them. This is what Kyle gives to you and so much more. spent months compiling the information contained within the 60 pages of this book.